Since the two eclipses of the past month the energies on the planet have accelerated greatly and our personal frequency signature has accelerated as well. At the Super Full Moon of this month we enter into an Event Horizon, (point of no return), and start a new 50 year cycle. We now move beyond thinking of 5th dimensional reality, and live it - embody it, as spiritual technologies now enable us to embrace our divine nature and express who we are as a Creator. 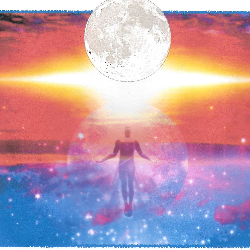 In a Multi-Sensory Journey we will view all of life’s possibilities and be led through an Initiation process which will activate a new template - one which will enable you to become a shape shifter within your own holographic world. 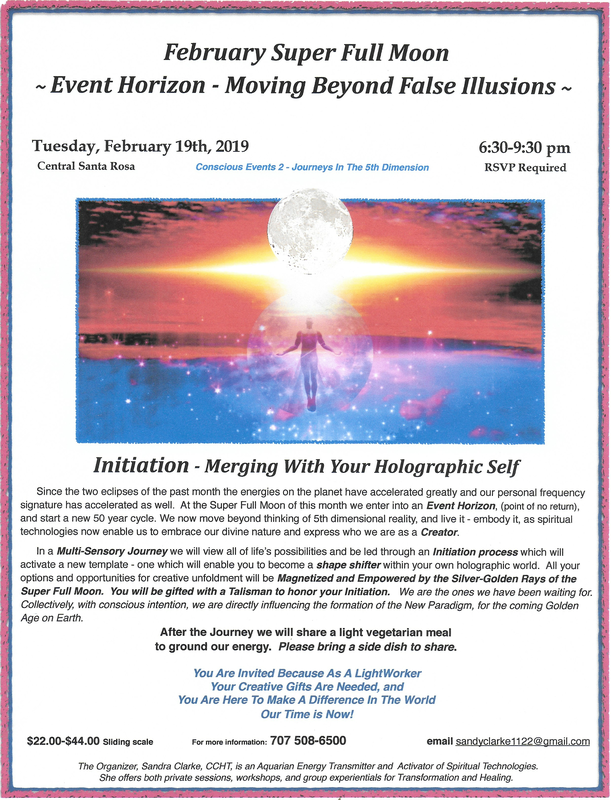 All your options and opportunities for creative unfoldment will be Magnetized and Empowered by the Silver-Golden Rays of the Super Full Moon. You will be gifted with a Talisman to honor your Initiation. We are the ones we have been waiting for. Collectively, with conscious intention, we are directly influencing the formation of the New Paradigm, for the coming Golden Age on Earth. After the Journey we will share a light vegetarian meal to ground our energy. Please bring a side dish to share. The Organizer, Sandra Clarke, CCHT, is an Aquarian Energy Transmitter and Activator of Spiritual Technologies. She offers both private sessions, workshops, and group experientials for Transformation and Healing.